Television | Star Car Central - Famous Movie & TV car news! Think you have seen all the star car movies? Since the 1970’s I’ve been an avid “star car” fan, builder, and collector. I’ve spent way too much time researching, and enjoying movie and TV cars as my main hobby. With a career in TV and films, I have had access to many of the screen used cars and spent many years on the backlots of studios looking under tarps and finding out little tidbits of info on these stars of the screens with wheels! Today, with the advent of “Google search”, most everything you may have a passing interest in can be answered almost instantly but not everything comes up on some of the older or less “famous” movie and TV vehicles. So today I’m just going to publish a small part of my “blog ideas” list, and see what you and other Star Car fans want to read about, and it can also be used as a check list if you want to see a film that also features a cool ride! Leave a comment on which car you want to see a blog about, and I will dig though my files and share my “analog” info along with what I can gather from my star car pals! ANTICHRIST LORRIE -(The Gods Must be Crazy). 1967 FORD SHELBY GT500 FASTBACK (Gone in 60 Seconds). June 25th (Wednesday) 2014 – “El Cajon Classic Cruise” STARZ CARZ NIGHT! 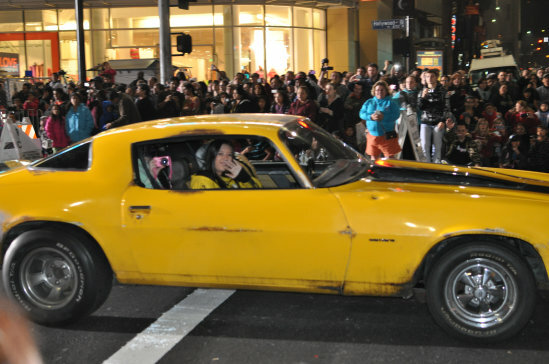 If you are in the San Diego area and want to see some movie and TV star cars, then tomorrow is your chance at the “Cajon Classic Cruise” STARZ CARZ NIGHT! Steve – in his Scooby Doo Mystery Machine! Diane – in her Roscoe police car from the Dukes of Hazzard! 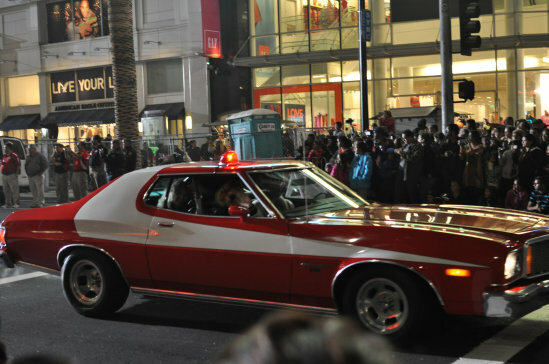 Mark – will bring his Gran Torino from Starsky and Hutch! Victor – with his version of the Black Beauty, from the Green Hornet! 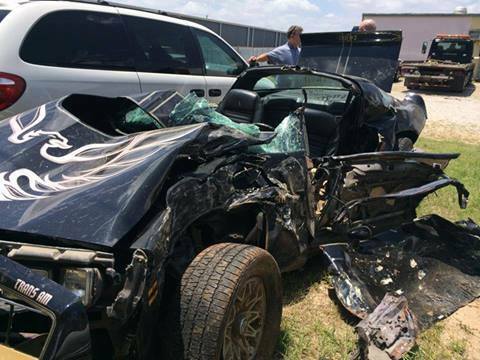 Tyler – WAS going to bring his Bandit, but it was TOTALED while he was in it just this last week! 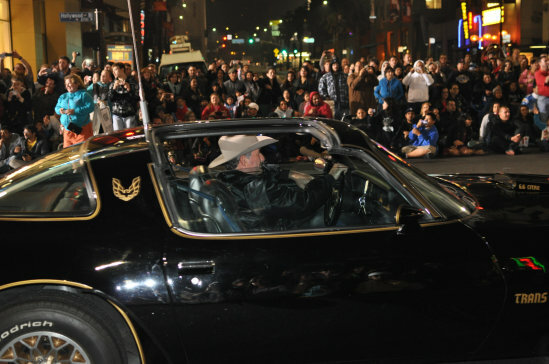 Tyler is on the road to recovery, but the Bandit is no more. Look for Tyler in the future with a new replacement Trans Am! 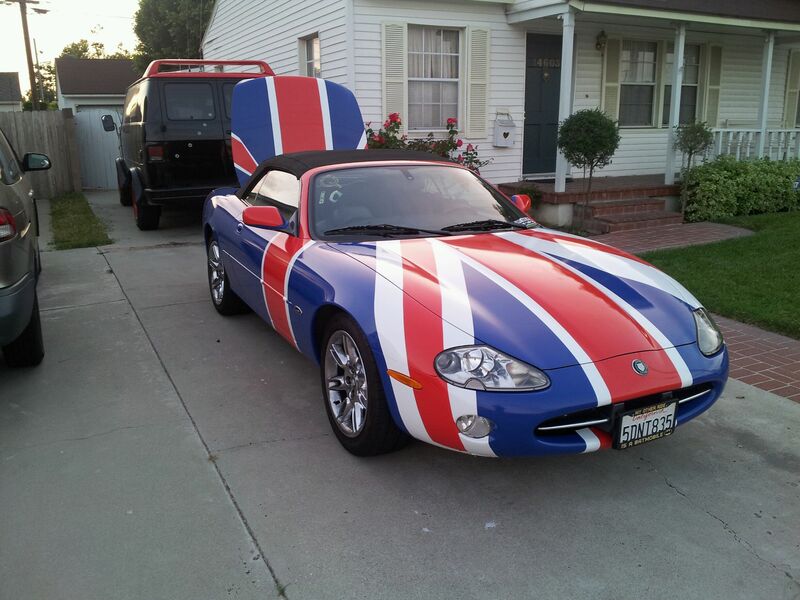 Obishawn – will be bringing not one but 2 Star Wars cars to the event! 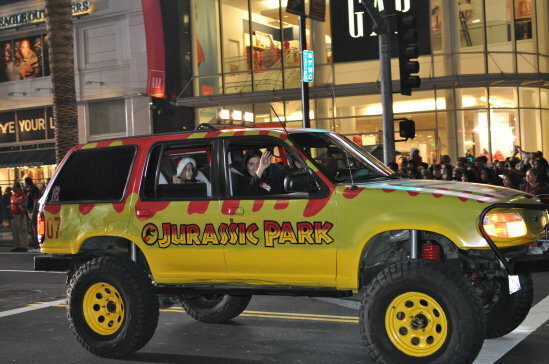 Ari – is bringing his ever popular Jurassic Park Jeep! Lee – Will be rolling in his pristine General Lee Charger! 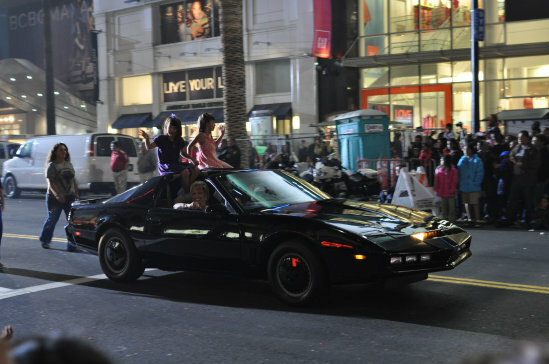 Jennifer – is also attending in her Super Persuit Mode KITT! Special Guest star? Rumour has it that NATE TRUMAN may actually appear south of Los Angeles in his Shaguar, but Adam West is doing an Autograph signing in Temecula at the same time… stay tuned, the best is yet to come! 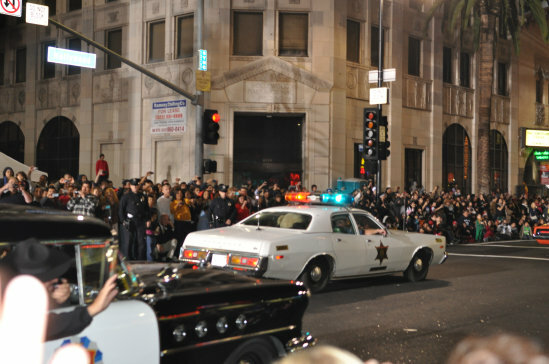 A look back at the Hollywood Christmas Parade, soon a bigger line up in Burbank April 6th! 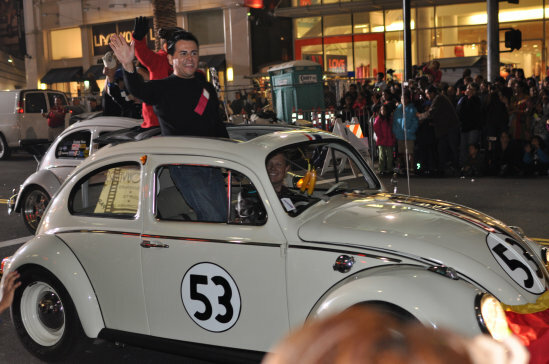 Ok, This is from a blog I found about the 2012 Hollywood Christmas parade, but he got our whole line up and had nice things to say about all of the members who came and participated! On April 6th we will have more than this epic line up, with a few new members and surprises as well! Come out to the Burbank parade and meet the Star Car Central team! Wait, what!? 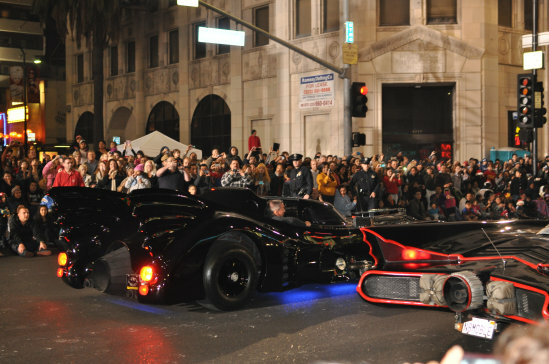 The 1960s Batmobile from the Adam West “Batman” show and the 1989 Batmobile riding together?? Awesome. The 1989 one even unleashed a bunch of firecrackers underneath it. Where does he get those wonderful toys? 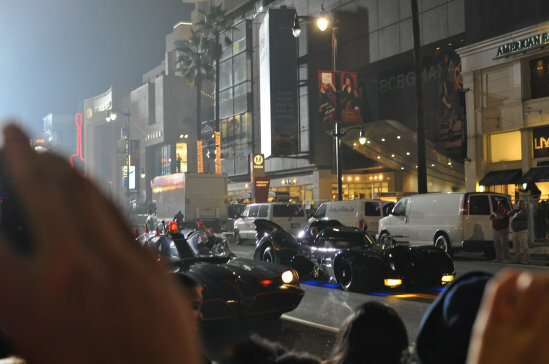 Another shot of the two Batmobiles. I’ll take one of each. Remember when cars looked cool? 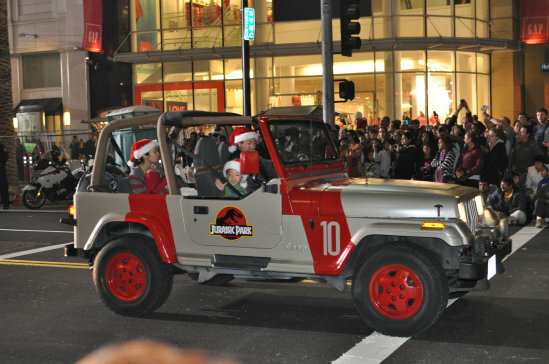 Okay, apparently the Christmas parade just turned into a pop culture cars parade, and I couldn’t be happier about it. 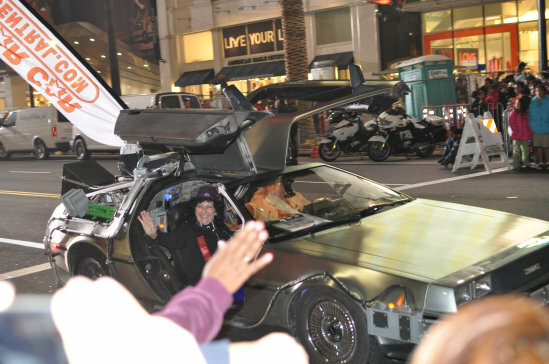 Here’s the DeLorean DMC-12 from “Back to the Future”. Another shot of the DeLorean. 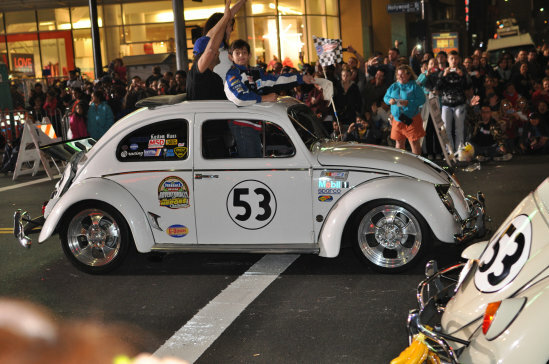 Not one, but two Herbie Volkswagen Bugs drove by. Herbie fully loaded, with stickers and new rims! The Pontiac Trans-Am from “Smokey and the Bandit”. 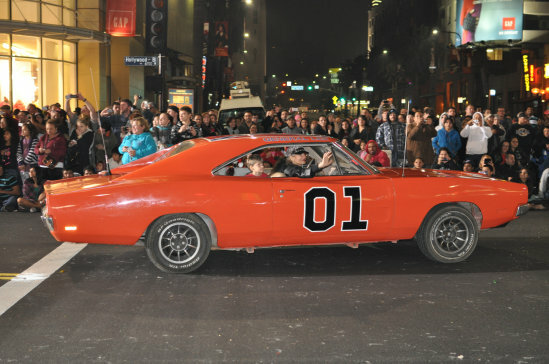 Look out, it’s them Duke boys speeding by in the General Lee! I wonder if Boss Hog will ever catch ’em. Apparently this was Bumblebee from the Transformers movie. I wouldn’t know, because I tried blocking that bastardization of a beloved childhood memory from my mind long ago. 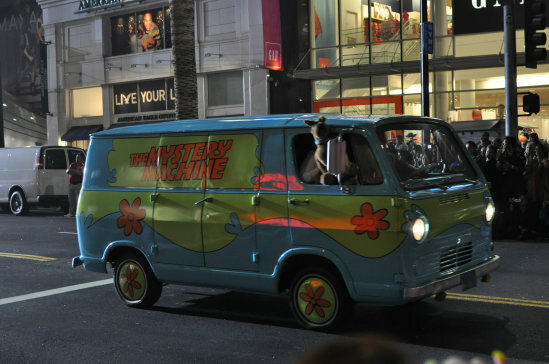 Scooby Doo riding on by in The Mystery Machine van! Well whaddaya know! It’s the Teenage Mutant Ninja Turtle Van along with April O’Neil walking beside it! 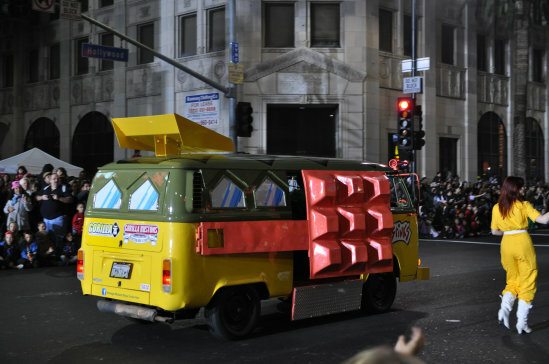 And yes, that’s the same van from the TMNT video I appeared in earlier this year. 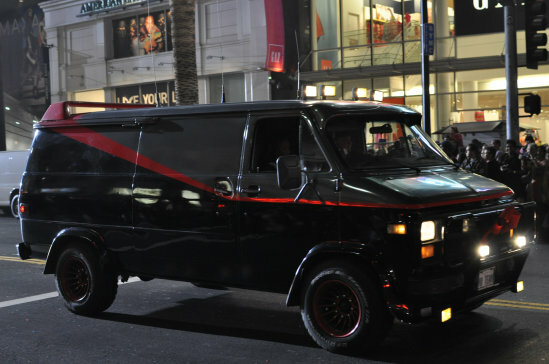 Probably the most intimidating van in history – the classic van from The A-Team. It’s KITT from Knight Rider. 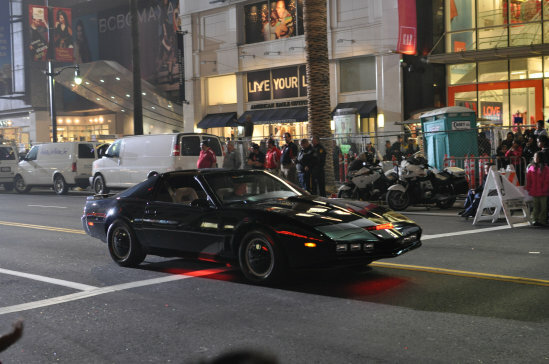 There was a second Knight Rider car that drove by and the motion lights on the front were gold instead of red. Time to go off-roading with Jurassic Park. Smile while you can kid… you’ll be devoured by a Velociraptor soon enough. Merry Christmas! from the film was nothing short of awesome. 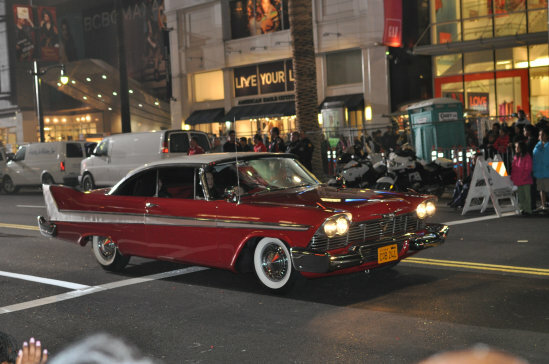 I do wish they had it playing 1950s rock & roll when it drove by though. 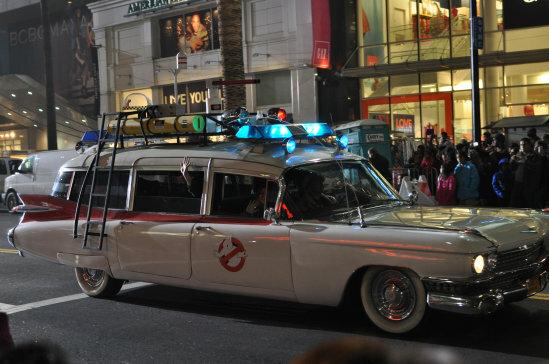 I’ve seen it plenty of times over the years, but the Ecto-1 from Ghostbusters is always a welcome sight. two Jawas with perfect glowing yellow eyes, a Tusken Raider, and Leia in the Boushh disguise. Amazing. 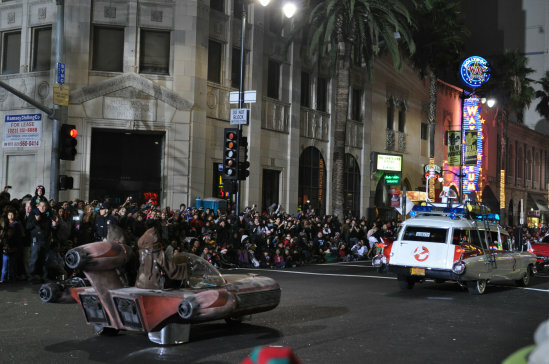 Nothing says “Christmas” like an X-34 Landspeeder chasing after the Ecto-1 chasing after Christine. I am getting lots of request to give out a “heads up” on when we will be appearing at events! So here’s a short list just for this month, of a few that are open to the general public. Come by and say “HEY” to the SCC members! See you there! (between White’s Canyon and Sierra Hwy) 5-9 pm., you can show up earlier if you want. The South Pasadena Police Department is located at 1422 Mission Street, South Pasadena, CA. All activities and tables will be to the rear of the station, located off of Hope Street. ROAD CLOSURES: Mission Street west of Fair Oaks Avenue to Orange Grove Avenue will be CLOSED to traffic from 5:00 AM to 5:00 PM. PAUL W “Goldfinger” ASTON MARTIN!!!! 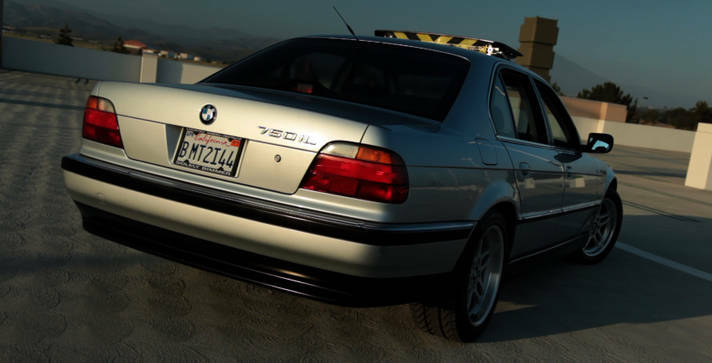 Highlight on “Q Branch” James Bond BMW! the adventures it was going to take him on! 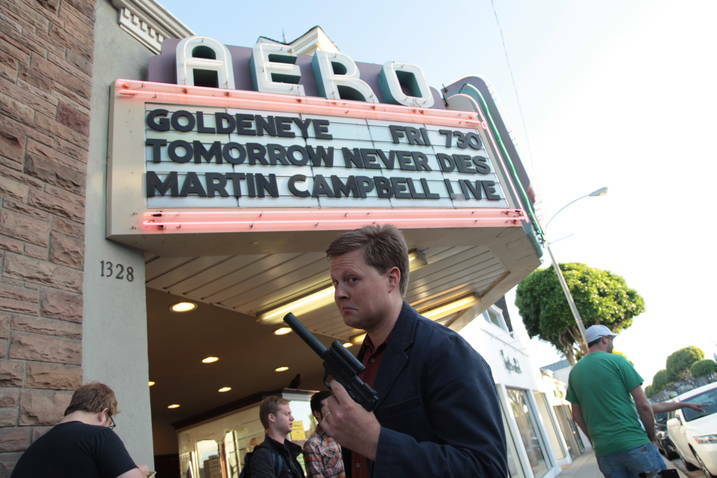 After many StarCarCentral.com appearances with his new James Bond Car, Brian was invited to a speical “Bond Cars Only” event! weapons deployed in case any SPECTRE agents show up! 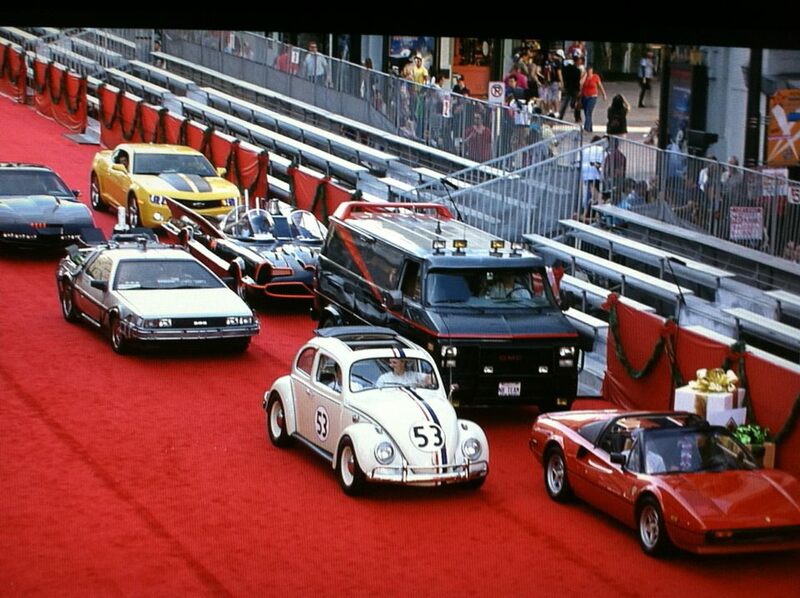 STAR CARS Assemble! Nate Truman’s StarCarCentral.com members get profiled on Crave!Online through out July through Sept new episode every two weeks! Way to work a weekend with your starcars, Brian! Star Car Central, around the globe! Well even though I invented the word “Crossgeeking” to discribe those fans who like more than one fan favorite item from two different worlds (like “Herbie the Love Bug” and speaking Klingon) I am certainly not the only star car fan who realized that the only thing better than seeing a famous movie or TV car driving down the street, is a whole bunch of them! The loose coalition of StarCarCentral.com chapters continues to grow and meet all around the globe! Here’s what’s going on around the world, in the world of StarCar get togethers, that is! 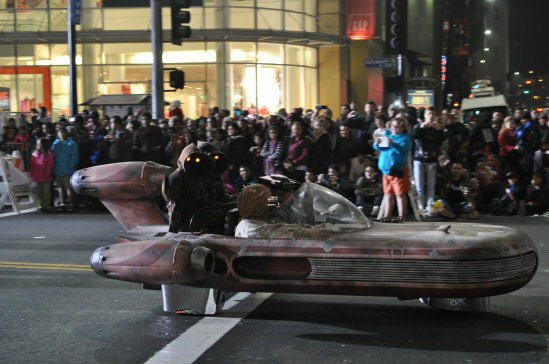 NATE TRUMAN’S STARCARCENTRAL.COM ON THE RED CARPET FOR THE 2011 HOLLYWOOD CHRISTMAS PARADE! In France Claude heads up an active chapter of his own, doing all of the hard work to organize weekend events. Star Car owners from France and near by countries have had several great get togethers in the last few years, and they have another one coming up! If you are in France why not stop by and join in the fun! 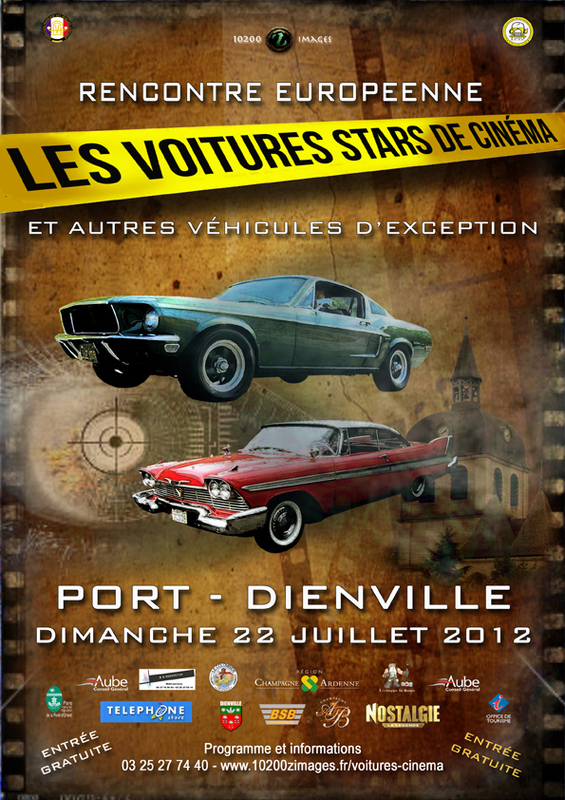 Just under two months before the Meeting of Cars stars of Cinema & TV in Port Dienville (France). Like last year, the lodging of Colombier welcomes us but with a little fewer rooms. We will complete with homestay but with limited possibilities. So I need to know soon if some of you are planning to join us during the two days (Saturday 21 and Sunday, July 22) that we may organize the reception at best. Of course I know it’s difficult for those who have anocean to cross ! I remind you that the home is offered for maximum 2 persons per crew. – 1:00 p.m.: Shooting a short film with our cars featured. 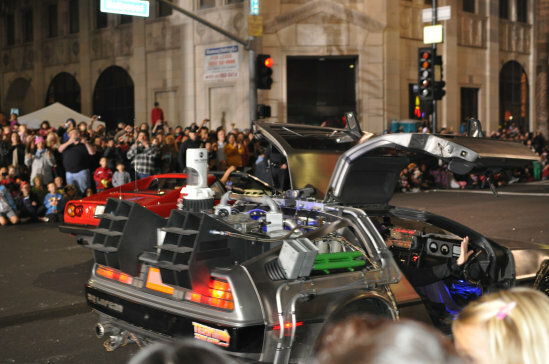 For its 10 years anniversary, the site http://www.retourverslefutur.com/ in collaboration with McFly Prod and 10200 Z’Images launched a screenplay competition on the theme of movie cars. After selection, the winning scenario is being re-write. We will send you as soon as it will be ready. – 7:00 p.m.: Appointment at Colombier for a festive and friendly presentation of the cars to the public. Buffet on site. – 10:00 Appointment with clubs and other owners (location will be specified later) then trek to Port Dienville (road book supplied). Besides, if you belong to a club, feel free to invite members on Sunday. The registration form will be posted on our web site soon and I will send you a pdf version to share. – Arrival at Port Dienville between 11:00 and 12:00. 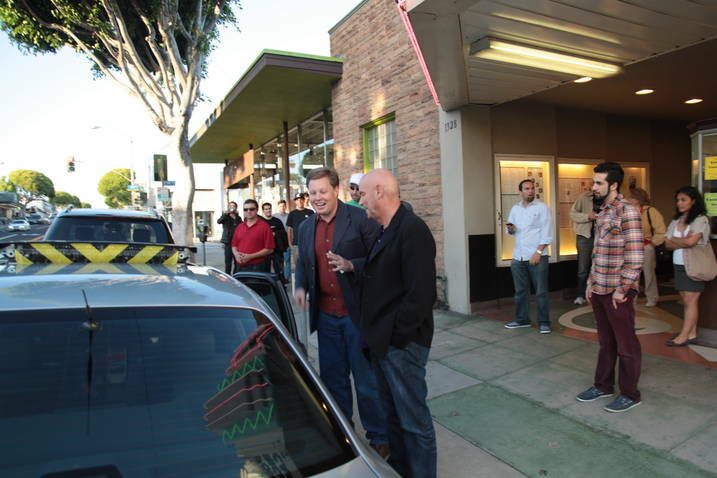 We anticipate a grouped arrival of the cars of Cinema & TV for the show ! convention for movie cars here in Belgium Bruges on the weekend of 6.7.and 8 september 2013 ,here you have the link to the page made http://www.facebook.com/groups/362397297148643/movie cars convention in Bruges next year . the weekend of 6, 7, and 8 september 2013 .on sunday 8 september i will organize even a meeting with all american cars , ihope you can all jon us .Please don’t add people from he U.S. or Ausralia or japan because those people won’t come ! !this convention is specialy for people from Europe !!! Nate Truman’s StarCarCentral.com gang were invited to be a part of the “Hollywood Treasures” TV show where Nate and Ken from TMPCC helped the staff and stars of the show locate the screen used Camaro from the first Transformers movie, SCC member Randy drove it in with the “seat suit” to hide the driver, so it looked like it was just driving itself. Randy also brought it out for the Drag races in Barona, CA. Charger Steve from the San Diego Chapter of StarCarCentral.com put on a great event with cars from Nate’s group going up against the San Diego area movie and TV car owners, for a long fun day of StarCar Drag Racing!!! Nate Truman’s Shaguar, vs Alex’s KITT from Knight Rider CLICK ON LINK TO WATCH! So the days of me hunting around the world for other fans with little result, has changed quite a bit! Spend some time and look around facebook, or google for events happening near you. 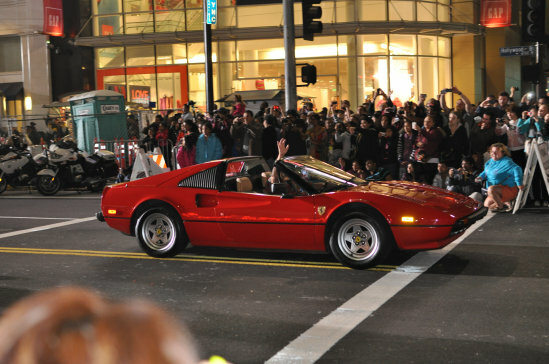 I am sure after a while you will start connecting with other movie and TV starcar fans and find they are a lot of fun to hang out with, and of course, DRIVE those cool cars! Crossgeeking at it’s finest. My Shaguar and A-Team meet up for the first time! So get out there and find a few “mates” to share your hobby! Enjoy, Share, and do some good – put some smiles on other people’s faces, and you just might find one on your own! 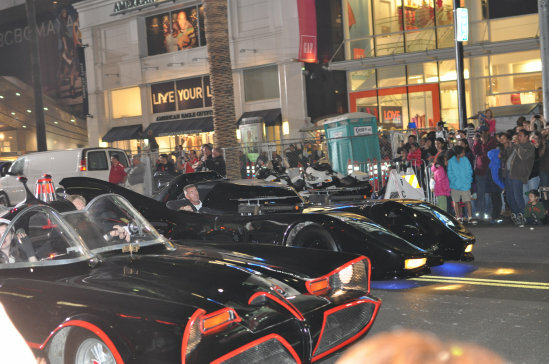 To the Batmobiles, Let’s go!!!! 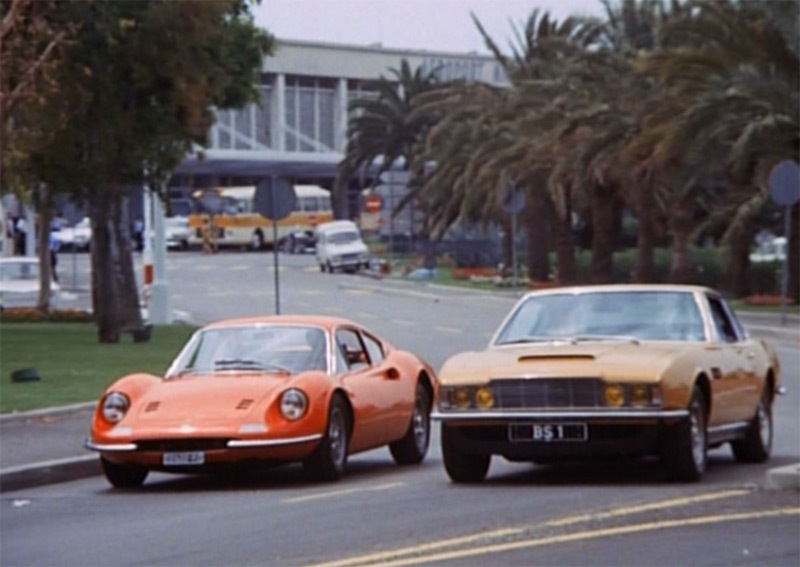 THE PERSUADERS, TONY CURTIS AND RODGER MOORE AKA JAMES BOND IN COOL CARS? WHAT’S NOT TO LIKE? It’s always fun to “discover” another star car show for me, and while youtubing I saw a video of Roger Moore being “reunited” with a yellow Aston Martin. That lead to several hours of “finding” the 1970’s series called many things, but it was mainly known as “The Persuaders”. If you just want a look at the two signature cars, just watch the top video. Here are the facts ala Wikipedia: It starred Tony Curtis as Danny Wilde, and Roger Moore as Brett Rupert George Robert Andrew Sinclair, 15th Earl of Marnock, referred to through most of the series by his courtesy title of Lord Brett Sinclair, two international playboys. Sinclair is an English aristocrat who attended Harrow and Oxford before serving as an officer in a Guards regiment and then becoming a Grand Prix driver and race horse owner. Wilde is an American who grew up in poverty in the Bronx before serving as an ordinary seaman in the US navy and then making (and losing) several fortunes on Wall Street, at least one of them in the oil industry. Both are jet-setting, London-based multi-millionaires at the time of the series. Much of the humour of the show derived from playful observations about the differences between British and American customs. The show ended after one season, in consequence of failing to make an impact on US TV, thereby releasing Roger Moore to star in the popular Bond films. The protagonists drive signature cars: Danny Wilde drives a Red left-hand-drive Ferrari Dino 246 GT, Brett Sinclair drives a UK-registered Bahama Yellow right-hand-drive Aston Martin DBS with V8 wheels and markings. 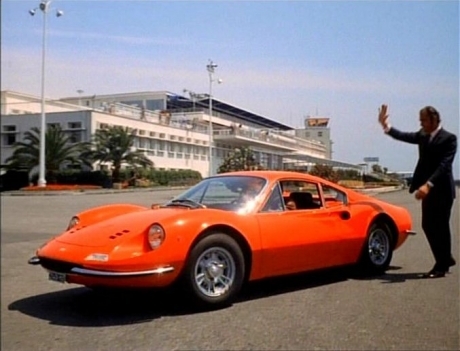 As with Simon Templar (Roger Moore’s character from The Saint television series), Lord Brett Sinclair’s car has personalised number plates of his initials; Templar’s were “ST 1”, Sinclair’s are “BS 1” (Except for one scene in the episode “The Gold Napoleon” where the car had its original UK registration number PPP 6H instead). In fact, the true owner of the plates at the time, Billy Smart, Jr permitted their fictional use. The Aston Martin from the show was sold by the factory after filming ended, via HR Owen in London, to its first private owner. It was restored to a very high standard in recent years by the Aston Martin factory and is still in private ownership in the UK. Danny Wilde’s car bears Italian registration plates, 221400.MO (the ‘MO’ component represents the city of Modena, which happens to be the headquarters and manufacturing base of Ferrari). The exact whereabouts of the Dino today is unknown but it is reliably believed to be alive and well in Italy with a private owner. 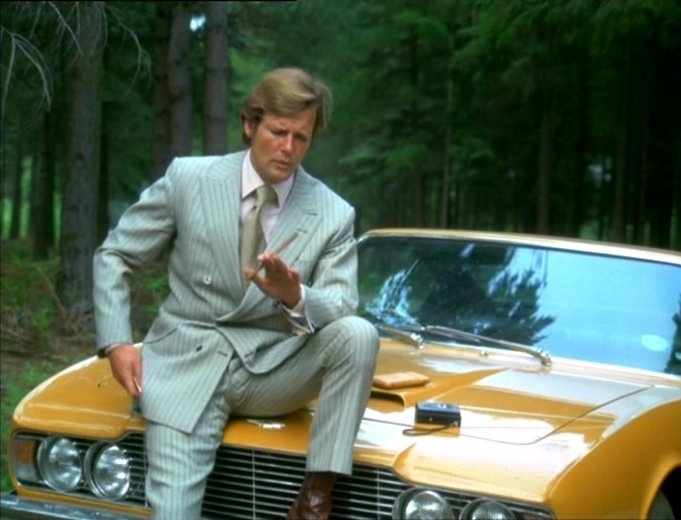 Here’s the video of the reunion of the Yellow Aston Martin and Sir Roger Moore. 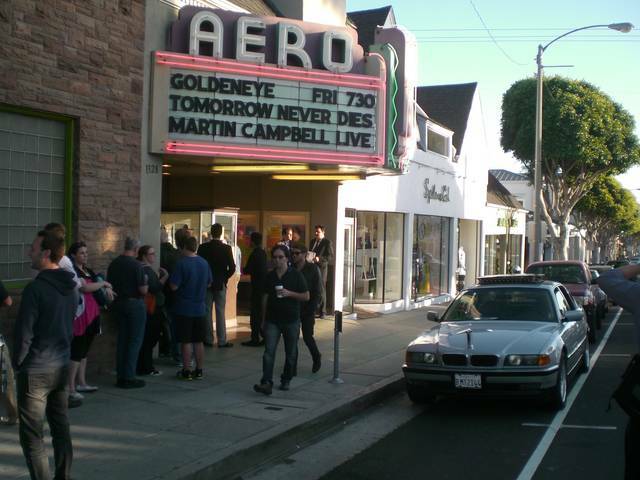 Fan boys are the same around the world, putting together events to relive their favorite shows! perform and promote their show while struggling with French, Italian, German etc. Even a funny out take where Roger Moore shows his English stripes when it comes to Germans! Take a look! This scene is the classic “American roughing it” vs the “British with class” bit. 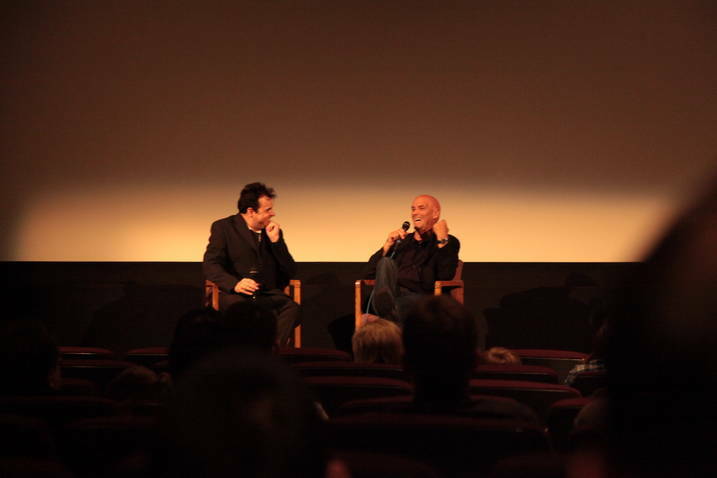 The series creator wanted to sell the show in the United States, and to try and help that sale, he wanted an American star. 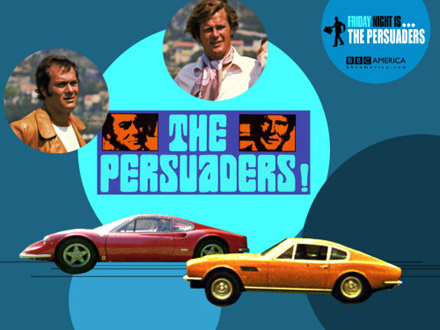 Even though it’s a fun concept and did very well in Europe – the Persuaders went head to head with “MISSION: IMPOSSIBLE” and only lasted one season. As all TV from this period watching it seems like everything is moving at half speed but there is a fun chemistry between the two stars. Below is a fun fight scene that gives you a taste of the show. Enjoy!